Hi Patsy. Chipmunks are interesting (and cute) critters. They actually hibernate in the winter, and before they hibernate they gather seeds and stash them away for later use. 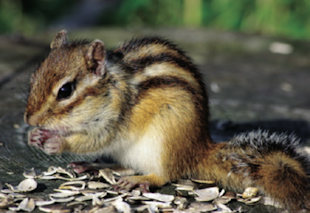 Unlike other hibernating animals that store their food reserves in the form of body fat, chipmunks do not. Consequently, it is necessary for chipmunks to awaken several times during the winter to eat from the caches of food they have stored. Your best option for chipmunk control is to eliminate their food sources; particularly bird seed, so they will look elsewhere for food before they hibernate. Most importantly, you should delay putting bird seed in your bird feeders until the winter months, after Chipmunks have begun hibernation. It is a good idea to have baffles on the poles of your feeders because chipmunks (and squirrels) are good climbers. They are also amazing jumpers, so locate your bird feeders away from the house. They are especially fond of sunflower seeds and you want to make sure to store all seed in chew-proof containers. I hope this helps.